a city is better explored with gelato in one hand after a full belly. note: we walked vienna on the two hottest days in june 2017. we were visiting friends who gave us the grandest tour. when we put the fork down, we were walking a few blocks to pick up the spoon. take the train from the airport to the city center. super clean and easy. lunch at figlmuller. known for amazing schnitzel. eat downstairs in the cellar. gelato at castelletto. no sampling allowed. go with your gut. i'm certain you won't be disappointed. demel for melange coffee and apple strudel. melange is the german word for the viennese blend. similar to a cappuccino. the desserts were on display. it's an art here. and you are expected to sit and enjoy. it's a good thing. we had literally finished up our gelato outside this place to throw away the remnants and step into this dessert place. you keep eating, but allow me to pause and say we need more "sweet" places to meet up at rather than happy hour and meal time. places to sit down with chandeliers overhead and talk long over coffee and sweets without being rushed. dinner at heindel's schmarren and palatschinkenuchl. yeah. just google it. it's a pancake restaurant. a crepe place. our host ordered a variety of sweet and savory. be warned...they are generous portions. this place is tucked on a small side street. seating indoors and outside. 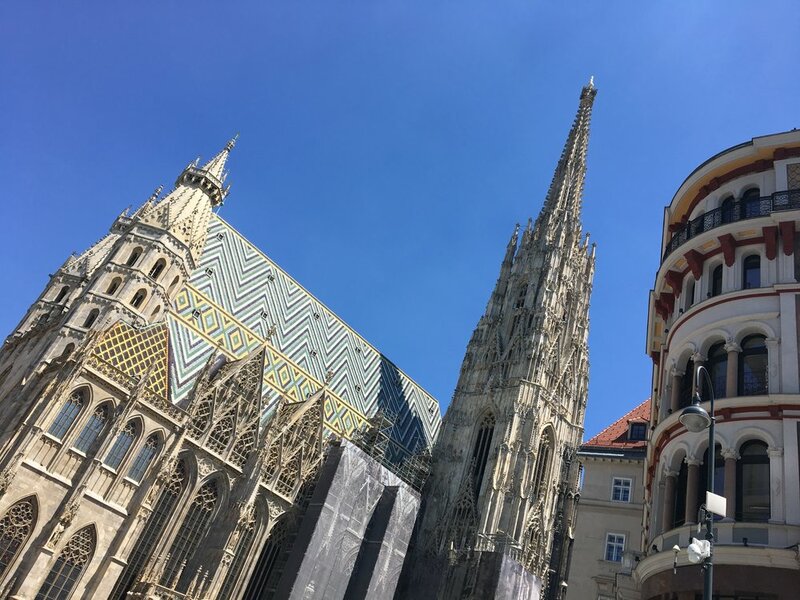 vienna city centre is all things shopping, dining, and appreciating the architecture. St. Stephen's Cathedral stands tall and reverent in the center of the centre. cobblestone roads and people in their happy place by being together. are you feeling our overstuffed tummy issues yet? though we felt like rolling through the city centre, we were civilized tourists and walked. but just enough to make a little bit more room for more dessert. before us was the vienna opera house with the most beautiful evening sky and the perfect lighting around the exquisite building. 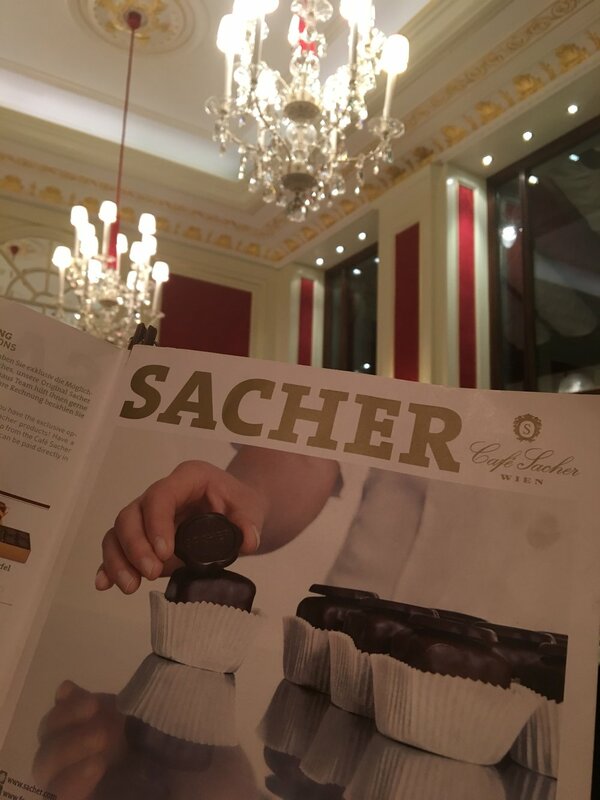 we had a splendid view as we took a seat at hotel sacher. red velvet in the most classy form popped out through the furniture and decor. this hotel reminds me of the plaza hotel manhattan, but much older and with more charm. 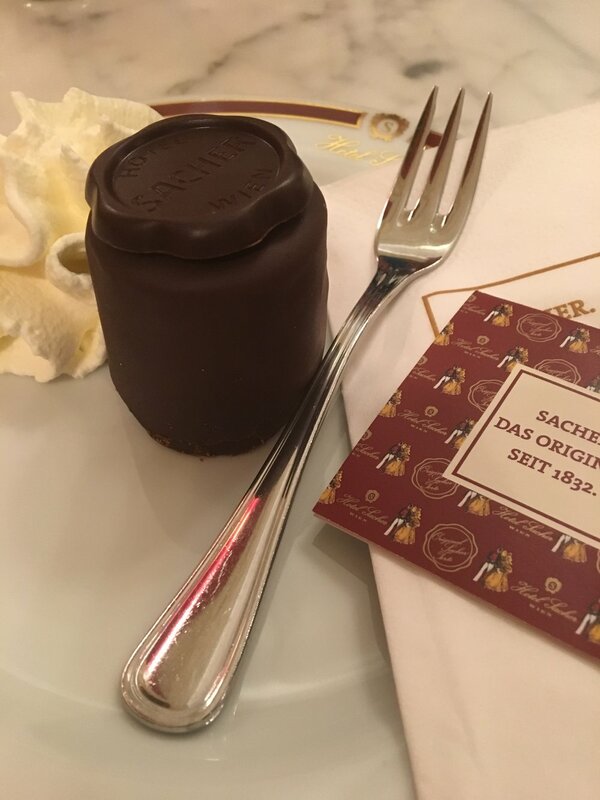 the original sachertorte is served on fine china. this is a rich chocolate cake. it can be found in many restaurants throughout the city and country, but this is the place it originated. can't you tell? sachertorte! we were done. we promised ourselves we would do more walking and less eating tomorrow. 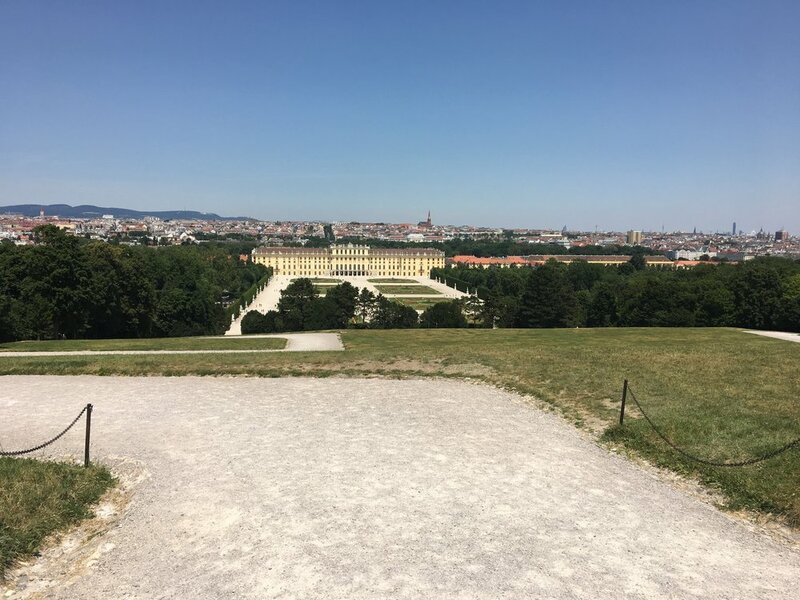 an outdoor walk around schloss schonbrunn, a palace with a massive backyard. tours outside are free. i envisioned such a party as i looked over my shoulder as we climbed higher and higher. the cafe in the back of the gardens is also at at entrance to the zoo. it's called landtmann's park cafe and it's just the prettiest cafe ever. my pictures don't do it justice to what you can find elsewhere on the internet. resisting all the good eats, i succumbed to a pineapple popsicle for the hike up the hill. she asked ben if he would push her up the hill we were all climbing! we shared a laugh and started introductions. jane and jim are from england and were traveling europe in their camper. she does all the driving and he the navigating. we want to be like them. we told them that. traveling the world together and not sitting still for long! "move while you can," they said. i offered them an invitation to come and stay with us in san francisco. that's why we took the picture together. so she won't forget us having met. i think they really might. i could see it in their adventurous eyes! without their camper, of course. we headed back to the city centre and found naschmarkt. the largest outdoor market with food stalls, produce, juices, gelato. places to stand and eat and places to sit and eat. it was sweltering. it was the heat of the day. why not take in a movie at the local theater? wonder woman was playing in 3d. this would give us some reprieve from the heat and then we'd be up for more walking. to see the movie, i put my sunglasses on my head and put the 3d glasses on. as we left the theater, i put the glasses on my head in the bin and subconsciously moved the 3d glasses to my head. with not a thought about it at all. 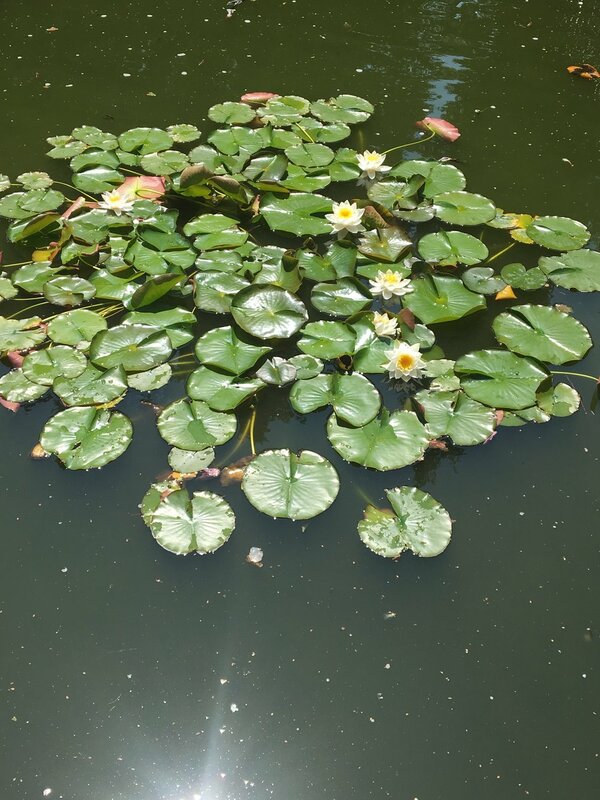 we remembered seeing such life down by the danube river the day before. i love how the path is for roller skaters, runners, cyclists, and pedestrians. for it's clearly marked. we enjoyed burgers at it's all about the meat baby! yep. that's the name of it. a casual outdoor dining experience right there on the river. the sun was hitting off the high rises. i lowered my glasses. wait a minute here. this isn't right. oh my goodness. we went back to the theater after dinner, but it was closed. those were such a great pair of sunglasses. now i have an unwanted souvenir. and a story. always a story. when God gives a city a river, the people decorate and recreate. and they do this through graffiti and "vienna picnics." the city boasts such community along the river. i didn't eavesdrop into their conversations, but i imagine that they were unwinding after a typical day and finding such peace being together. when we travel places, God wants us to see the people, for they are the greatest sight of the city. you wouldn't believe me if i told you we ended there. 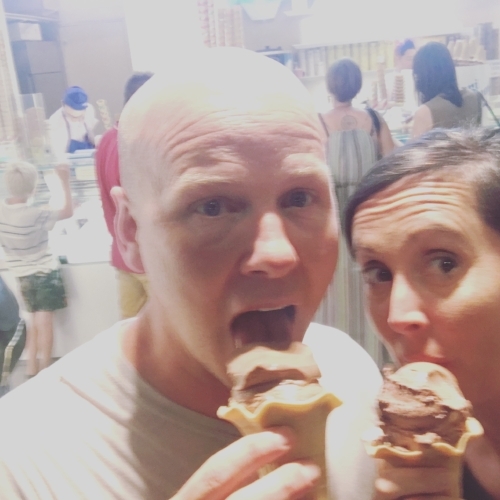 we had to end on gelato. zanoni and zanoni for the win. for this sums it up. when in vienna, eat gelato and walk the streets and talk for hours. it's what everyone else is doing. everyone else. 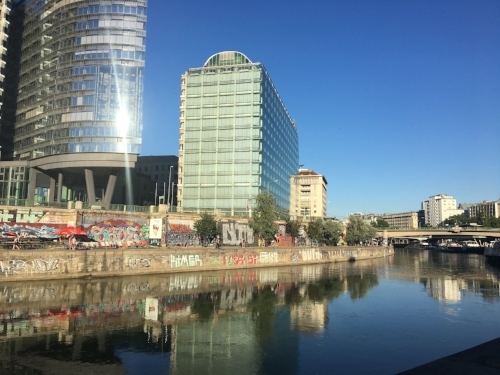 have you traveled to vienna? what would you suggest?